Ulrich Ostergaard and Ged Rathbone. Captain Ulrich Ostergaard admits he craves more success for Panthers. The Danish star, who will serve as skipper for the fourth consecutive season, has enjoyed team and individual glory during his time with the city club. The 35 year-old was part of the last Panthers side to claim title honours with a famous Elite League Grand Final success against Reading in 2006. And he was also responsible for the club’s last major triumph when lifting the Premier League Riders’ Championship in 2015. Now, he would love to provide more memorable moments in the new campaign. “I always look forward to the start of a season,” said Ostergaard. “I’m probably more excited about this one because of the disappointing way that 2016 ended. “We were gutted to drop out of the play-off places and hopefully we can make up for it with good results this year. “The management have told us the emphasis will be on fun and that’s really important. “It might be business at the end of the day, but you don’t get the best out of people if they are not enjoying their work. “There’s no pressure on us this year, but hopefully we can go out and bring home some silverware. “I’ve had some good times as a Panthers rider and I love everything about this club to bits – the promotion, the fans, the track, it’s all brilliant. 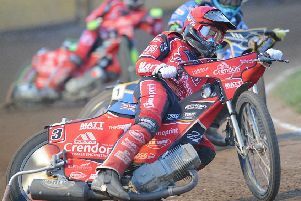 Those sentiments are echoed by promoter Ged Rathbone ahead of his first season as Panthers owner, following a winter purchase of the club from Readypower supremo Rick Frost. “I don’t think there is a stand-out team, or one that looks particularly weak either,” admitted Rathbone. “It is going to be a hugely exciting season with the racing likely to be closer than ever. “If our riders live up to our expecations of them, we will be challenging at the top end of the table. “I’m sure there will be setbacks along the way and we’ll deal with them in a positive manner. “We’ve put things in place to help us monitor riders closely and that allows us to work with individuals if we feel it is necessary.